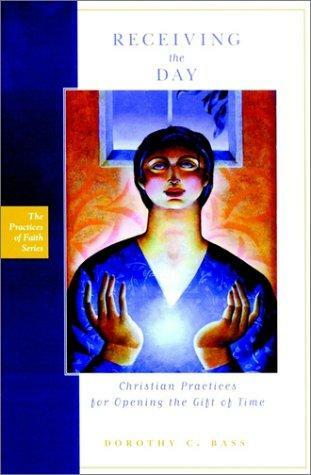 Receiving the Day: Christian Practices for Opening the Gift of Time, by Dorothy C. Bass as part of the Practices of Faith Series. Jossey-Bass, 2000, 142 pp. This was exactly the right book at exactly the right time. I have owned it since 2004 (according to the inscription from my mother). At that time, we had both been doing a lot of reading about the practice of keeping Sabbath, and sharing our favorite books. For some reason, I never got around to reading this one until now. As I began my sabbatical, I desperately needed a resource to help me slow down and be present to this time. Far more than a guidebook to Sabbath-keeping, Dorothy Bass devotes much of this book to simply exploring and explaining how to receive time as a gift, rather than spending our lives judiciously spending, managing or using it. In the spirit of the book, I did not allow myself to consume it in one day, but divided it up and read it over the course of four days. I wanted to be able to spend time reflecting on each section, instead of just assimilating information. Although it could be read in one sitting or one day, I recommend against it. The book deserves a slow reading. In sum, Bass attempts to reposition our relationship with time from use to gift. She then goes on to explore Christian practices that help us cultivate this different kind of time. She examines practices to welcome the day (like morning and evening prayer), to mark the week (keeping a Sabbath day in ways familiar and new), and to follow the rhythm of the Christian year, which enables us to keep company with God’s actions in the past and God’s promises for the future. I have already written about how this book has impacted my sabbatical journey by helping me to let go of my to-do lists for the remainder of sabbatical. There is another practice Bass suggests that I have already incorporated into my daily life. As we contemplate each day as a gift, she tells the story of a mother who asks her children every night, “Where did you see God today?” That is everything I wish to reclaim in my spiritual life, everything I wish to learn and see in this sabbatical time—the ability to see God in every day, and take time to name it and give thanks for it. Yet it took Bass’ book to give me the right question to ask, and a framework for asking it. Starting three days ago, I began a new journal. Every night, I ask myself the question: “Where did you see God today?” and write it down in a little notebook by my bedside. It is already starting to attune me more deeply to the God-moments of each day, and the practice of writing them down gives me a chance to reflect on them. I can keep prayerfully meditating on God’s presence in the day as I drift off to sleep. The challenge will come when I complete sabbatical and return to “regular life.” But this practice is one I hope to hold on to, and I hope it will hold me in a spirit of holy time, receiving the working days as easily as the resting ones. If you struggle to find God in the everyday, if you feel like your life is living you rather than you living your life, if the time is moving too quickly or just seems too full, read this book, and read it slowly. And try out a practice or two to appreciate the gift of time and receive the day. After taking B to school, I went to a nearby park to take a walk. Instead of my normal alt-folk-rock Pandora mix, a classical station appeared. I realized that wordlessness suited my prayerful mood, and set out walking. What happened next felt like magic, a mystical revelation of God’s presence. The music was in 3/4 time, and my feet slipped into a waltzing pattern. I couldn’t help it—it felt like I was dancing along the path instead of just walking. I first noticed it as I came upon the duck pond. Over the music in my earbuds, I could hear the quacking and squawking—and they seemed perfectly attuned to the pulsing staccato of the symphony. As the wind blew through the trees, I began to imagine that nature’s own movements had been choreographed to the music in my ears. Through a short line of trees, the thickness of the symphony dwindled at the same moment I stepped into a wide, open meadow. The chatter of the symphony calmed, as did the ducks. The violins played a simple melody, clear and smooth, as a solitary bird flew overhead, from one end of the meadow to the other. I waltzed across the meadow entranced, open to the simple melody, to the space and to the spirit. The symphony grew thicker and more invitational, and I approached a grove of trees. I imagined them welcoming me into their fellowship, out of the solitude and emptiness of the open meadow and into a space of warmth and companionship. Together we frolicked with the lilting of the music, and I felt like I was a guest at a lovely party. I found myself triple-timing the waltz steps, and my arms followed the arc of the music. Slowly, the music turned heavier, as the grove of trees also became more dense. I felt the weightiness of journey, of struggle, of pilgrimage. I contemplated the way our life’s journeys twist and turn, grow thick and thin. Sometimes we are surrounded by friends, sometimes we are alone. I kept walking in time with the music. The tension and discord grew heavier, then suddenly exploded into fullness and light, beaming with deep radiance. I felt my Spirit coming alive. God did not choreograph the movements of the trees and the birds to the movement of my feet, like Disney’s Fantasia, but God opened me again to the music of the world, to the ability to pay attention to all that was happening around me. These are the things for which sabbatical was made. Long walks, a spirit of prayer, attentive listening. For resurrection. Thanks be to God.